Ugh .... thanks for the PSA. I'm pretty sure I ran into a tick or two at Strozzi Ranch, May 2016. I climbed Needle Peak on Friday. Shortly after reaching the summit, I felt something crawling on the back of my neck. Swiped it off and it was a tick. Yuck! Did a thorough check of my clothes and gear when I got back, fortunately no more hitch hikers (at least not this time; see below). This is the first time I can recall finding any within DVNP. I've certainly run into them in other places. The two worst I can recall was Kingston Peak (Zdon mentions ticks in his guidebook) and Bare Mt. near Beatty (I climbed via Tarantula Canyon). These are both brushy bushwhacking routes. On Kingston, I saw several on my clothes during the day. Worse, one had got into my shirt and dug itself in on my abdomen, above the waist line. At the end of the hike, I found another in my clothes. On Bare Mt., I again kept finding them walking up my pants legs. Another reason why I will always wear long pants, at least for off-trail hiking! I know on this occasion I tried spraying OFF all over my pants legs, but it was no deterrent whatsoever. Again at the end of that hike, I found two of them in my clothes, but none latched on me. In the past I have also found ticks inside my vehicle! Which is bad because I live/sleep in it when out in the boonies. That is one reason why I always check over my clothes and gear before putting anything back inside the vehicle. Oh no, that's terrible! I'm sorry to hear you had one latch onto you. What method did you use to get it off? This was the first time I'd ever seen any before in my life. I didn't realize they would be in Death Valley. Yeah, I will always wear long pants on a hike where there's any brush. Glad you got the one of off your neck at Needle Peak. I think I was about 4,000 feet up and they were in the dense undergrowth around the dried stream beds and springs east of the Saline Valley. I'm pretty sure I was in Quail Canyon, but I'm not 100% sure. I think I just used the little tweezers from one of those small Swiss Army knives. After that I bought one of those tick keys which I keep in my hiking pack. Fortunately, the one on needle Peak was still just walking around on my neck so it was easy to brush it off. Almost everyone in our group found ticks from the jail canyon area last year. Those suckers are annoying. Good to know, thank you for sharing that. 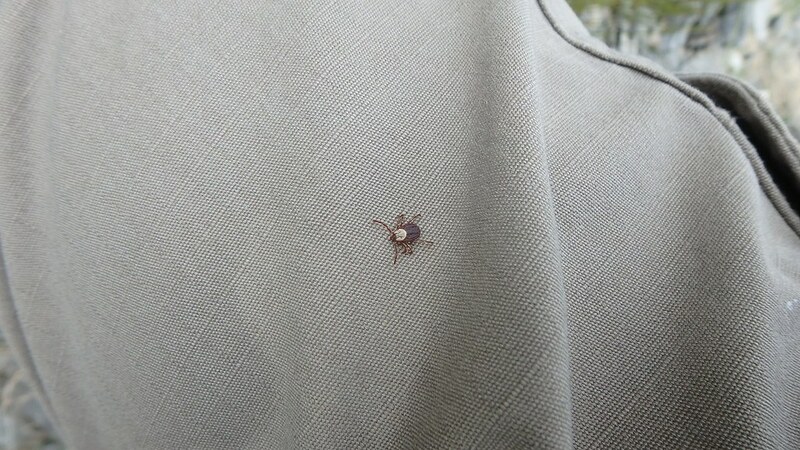 The ticks I had on me in Quail Canyon, east of the Saline Valley, were the first ones I've ever seen in my life. I agree, they were annoying. Strozzi ranch a few years ago, felt something in my waistband area, sure enough a damn tick was burrowed in me. Got him out and went on with my day. I know this is an older post, but you can buy tick repellent clothing. It has Permethrin in the material and will repel ticks, mosquitoes, etc. You can also buy Permethrin at REI and Amazon and spray your existing hiking clothes. I have pants and a shirt with it and I sprayed a second set of hiking pants and a shirt and it worked like a charm. Excellent info - thank you for sharing that! I've heard of that stuff but haven't bothered to try it! A spray can of insect repellent is usually one of my hiking essentials, except in truly cold weather. This would be a can of one or another of the popular brands. During a hike in one tick-infested area, I tried spraying that all over my pants. Because the can said it could repel ticks. Well, that stuff seemed to have zero deterrent value against ticks, or the ones in that area at any rate. I even sprayed some directly on a tick and it didn't seem fazed at all. Wow, the tick didn't react at all when it was sprayed? That's scary! Did the repellant you were using contain deet? Or was it another chemical that didn't seem to repel the ticks? It was probably "OFF" brand repellent, which does have deet. But they sell several varieties, so I don't know the amount of deet in that one. The outing I'm talking about was an April 2017 hike up and down Bare Mountain south of Beatty. I used the route via Tarantula Canyon. Below is one of the nasty critters from that day, where I usually find them: walking on my pants leg. According to my notes, I found 8-10 ticks on me during that Bare Mt. hike! Including two after the hike, one in my clothing and another that was hitchhiking on a fleece pullover I had worn. Thankfully none of them actually latched on to me.